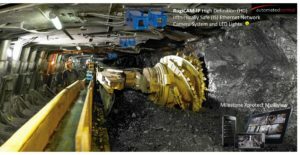 RugiCAM IP – Intrinsically Safes Camera Systems approved for Australian Coal Mining with Mileston Xprotect multiview software. This software has options that can monitor 8 cameras, 40 cameras and unlimited cameras. Once installed then the system can be viewed by Mac, PC iPhone and Android devices.